Chromatic aberration is the most serious aberration that affects any optical telescope. It is, however, easily avoided. Reflecting telescopes use mirrors to collect and focus light. Since these rely on reflection, and not refraction, they are free from chromatic aberration. Mirrors are also simpler than lenses in that they only have a single optical surface. Mirrors are usually made of a rigid, hard (i.e. polishable) material with a low thermal expansion coefficient (such as the glass Pyrex), and coated with a thin layer of aluminium, silver or gold to give high reflectivity. A telescope which uses a mirror to collect and focus light is known as a reflector. Reflectors, are not aberration free, however. The easiest mirror to make is a spherical mirror. Figure 39 shows that the rays from the edge of a spherical mirror come to a focus nearer the mirror than do rays from the centre of the mirror, causing a point source to be imaged as a blurred disc. 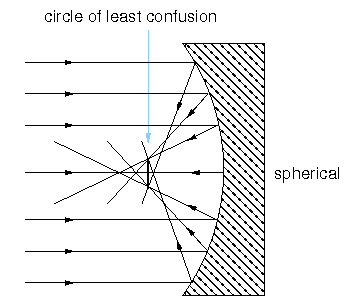 This defect is known as spherical aberration. The effects of spherical aberration in mirrors can be reduced by positioning the focal plane coincident with the circle of least confusion, as shown in figure 39, but this still leaves an unsatisfactory blurring of the image. However, the Scottish astronomer James Gregory realised in 1663 that spherical aberration can be eliminated if the curve of the surface of a mirror is a parabola. 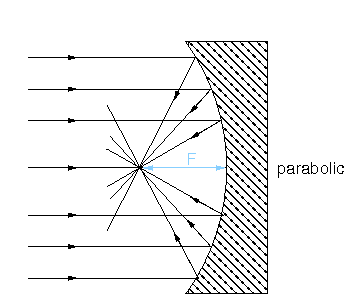 This is also shown in figure 39, where all on-axis rays parallel to the axis of a parabolic mirror are reflected to meet at the focus of the parabola. Creating mirrors with parabolic surfaces is not straightforward, as special grinding and polishing techniques are required in order to create the deeper central depression of a parabola compared to a spherical surface. 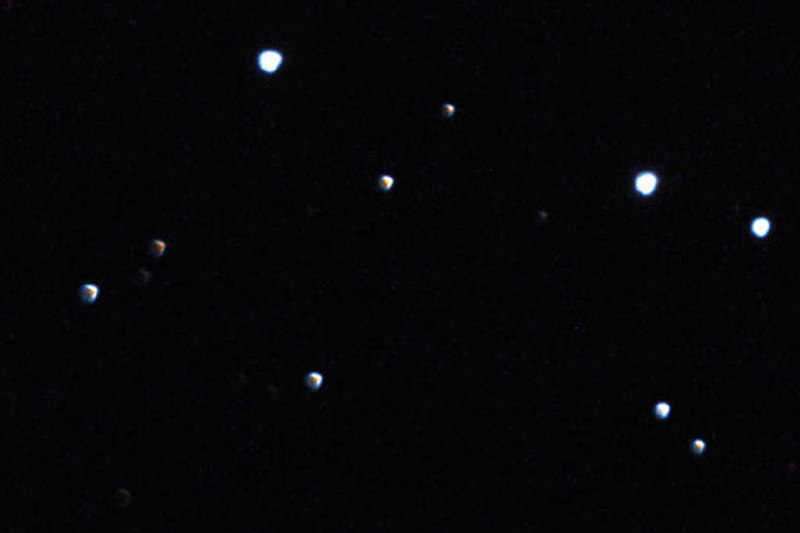 A famous example of spherical aberration is given by the Hubble Space Telescope (HST), which suffered from spherical aberration due to a mistake during the manufacture of its (hyperbolic) 2.4m mirror, as shown in figure 40. Corrective optics were later installed by astronauts on a space shuttle servicing mission and the telescope is now functioning perfectly. 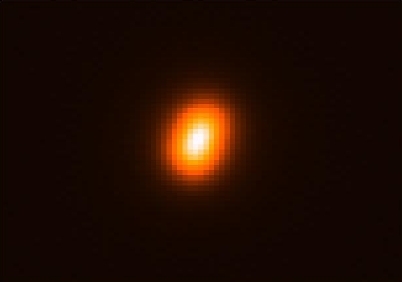 Figure 40 - Left: Image of a star taken with the HST, showing the blurred, circularly-symmetric image characteristic of spherical aberration. Right: Image of a star taken with the corrected HST, showing just the Airy disc and diffraction rings, indicating that the spherical aberration has been successfully removed: the image of the star on the left covers approximately 2 arcseconds, whereas that on the right covers only 0.05 arcseconds. It should be noted that lenses, and hence refractors, suffer from spherical aberration in exactly the same way as mirrors, but it is a much smaller effect than chromatic aberration. Spherical aberration can be eliminated from refractors using aspheric lenses, in which the curvature of the surfaces is not constant, but these are difficult and expensive to produce. It is more common to remove spherical aberration from refractors by designing achromats in such a way that the negative lens cancels out the spherical aberration introduced by the positive lens, whilst still correcting for chromatic aberration. Parabolic mirrors only bring on-axis light to a single point of focus. In figure 41, we see what happens when off-axis sources are imaged using a parabolic mirror. We can see that the light is not brought to a well-defined focus, thus producing off-axis aberrations. Note that these aberrations are not unique to parabolic mirrors: refractors and spherical mirrors suffer from them too. 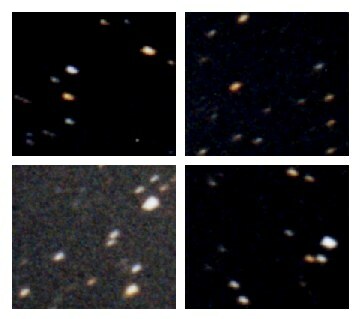 Due to their nature, off-axis aberrations affect objects imaged at the edges of the field of view. Figure 40: Schematic showing off-axis rays of light being brought to focus by a parabolic mirror. For off-axis rays, there is no good focal point, leading to aberrations. We will only briefly discuss off-axis aberrations here. If you want to know more about how they arise, see Vik Dhillon's detailed notes. For more info on each off-axis aberration, click on the buttons below. Coma is the largest off-axis aberration. It derives its name from the comet-like appearance of the resulting images, as shown in the figure below. At the centre of the focal plane, the images of the stars are point-like. Moving towards the edge of the image, however, the stellar images become increasing comet-like, with the faint, fanned "tail" always pointing away from the centre of the field. The next most important off-axis aberration is astigmatism. Astigmatism can easily be recognised in a telescope if the images of off-axis point sources are elliptical. The presence of astigmatism can be confirmed by adjusting the telescope focus, i.e. moving the focal plane, first one way and then the other. The ellipse should turn into a circle and then into an ellipse again on the other side of the best focus, but with its major axis rotated by 90o. It is important not to confuse this aberration, which affects only off-axis images, with the eye defect of the same name, which affects the entire field of vision and is due to a misshapen eye lens. Distortion of field is said to be present when the plate scale varies over the focal plane, as shown in the figure. The yellow box in the left-hand image is near the field centre. 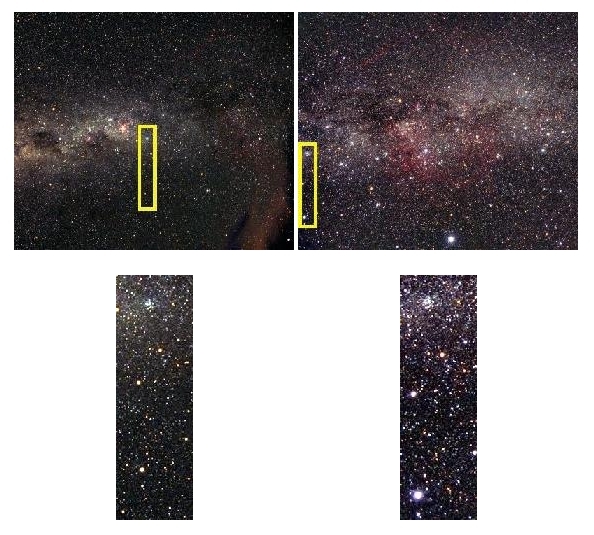 The positions of the two brightest stars in this yellow box should be compared with the positions of the same two stars in the right-hand image, which are now at the field edge. It can be seen that, although the individual stellar images appear aberration-free, their separation is much greater in the right-hand image, i.e. the plate scale is smaller. Curvature of field is said to be present when the points of best focus lie on a curved rather than a flat focal plane. An example of the resulting image is shown in the figure, which shows the corners of a much wider field photograph. The image shows how the blurring occurs in a radial direction with respect to the centre of the field. Curvature of field can be reduced using field flattening lenses. James Gregory was never able to bring his telescope design, known as the Gregorian, into practical use, and it is Isaac Newton who is credited with making the first working reflecting telescope in 1668. His design, known as the Newtonian, is shown in figure 41. The Newtonian is a two-mirror telescope in which the first mirror in the light path, known as the primary, is a concave parabola. The secondary mirror has no curvature at all and is hence referred to as a flat. It simply folds the light through 90o, placing the focal plane just outside the incoming beam. The focal ratio at the Newtonian focus is typically about 5. The secondary mirror is inclined at an angle of 45o with respect to the primary. The base of the flat is actually elliptical in shape so as to minimise the size of the circular shadow it casts on the primary. Although small amateur telescopes still adopt a Newtonian configuration, visual access to the focus becomes inconvenient as the telescope becomes larger, and mounting instrumentation there would unbalance the telescope, as demonstrated in figure 41. Hence Newtonians are rarely found in professional observatories. Figure 41 - Top: A schematic of a Newtonian reflector. Credit: Vik Dhillon. Bottom: A photograph of a modern Newtonian reflector. Figure 41 - Left: A schematic of a Newtonian reflector. Credit: Vik Dhillon. right: A photograph of a modern Newtonian reflector. In 1672, the French priest Laurent Cassegrain developed another reflecting telescope design which is now named after him - the Cassegrain. This design, shown in figure 42, has been adopted by the majority of the world's largest telescopes due to the convenience of mounting instrumentation at the focus. 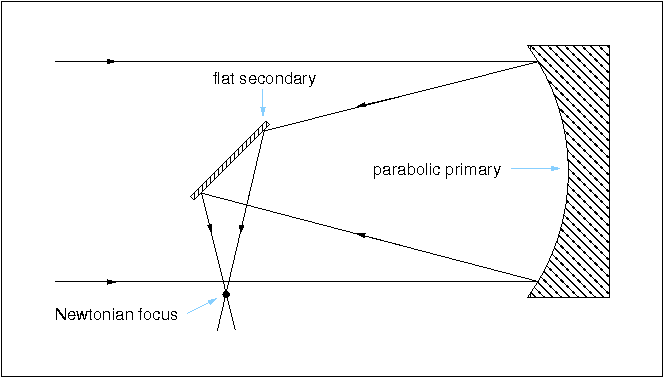 The Cassegrain telescope has a concave parabolic primary mirror like the Newtonian, but it employs a convex hyperbolic secondary. This increases the focal length of the telescope and reflects the beam back towards the primary, where it passes through a hole bored in the centre of the mirror and comes to a focus just below it. This is a much more easily accessible focus than the Newtonian, and an ideal place to mount large and heavy instrumentation. Compared to a Newtonian, nothing is lost by having a hole in the primary, as this region of the mirror lies under the shadow of the secondary. 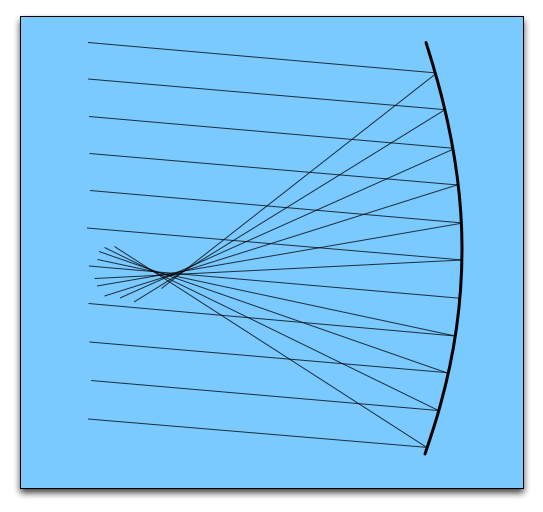 Moreover, because the beam is folded back on itself, it is possible to have a much longer focal length telescope without a correspondingly long tube: the focal ratio of a typical Cassegrain focus is 15. Another advantage of the Cassegrain design for professional observatories is that removing the secondary mirror gives access to prime focus. This is equivalent to the Newtonian, and provides a much smaller focal ratio and hence larger field of view than the Cassegrain focus. The wider field makes prime-focus imaging more susceptible to off-axis aberrations than Cassegrain-focus imaging, hence lens-based correctors are usually required at prime focus. 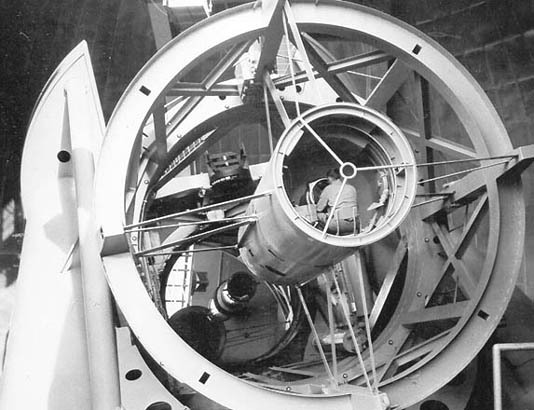 Figure 43 - Top: Photograph of the 5m Hale Telescope on Mount Palomar, California. This telescope is a Cassegrain reflector and was the largest telescope in the world between 1948 and 1993. Note the instruments at Cassegrain focus. Bottom: Photograph of an observer in the prime focus cage of the Hale telescope. Nowadays, remote operation of prime-focus instrumention means that it is no longer necessary for astronomers to spend the night in the cage! 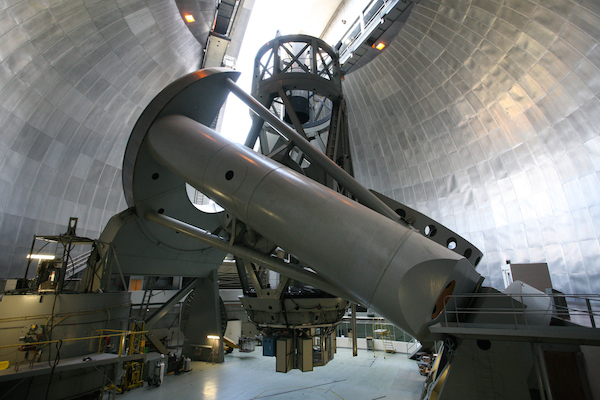 Figure 43 - Left: Photograph of the 5m Hale Telescope on Mount Palomar, California. This telescope is a Cassegrain reflector and was the largest telescope in the world between 1948 and 1993. Note the instruments at Cassegrain focus. Right: Photograph of an observer in the prime focus cage of the Hale telescope. Nowadays, remote operation of prime-focus instrumention means that it is no longer necessary for astronomers to spend the night in the cage! Both the Newtonian and Cassegrain telescopes suffer from significant off-axis aberrations, primarily coma. To remedy this, the American and French optical designers George Ritchey and Henri Chretien jointly developed the Ritchey-Chretien telescope around 1910. The Ritchey-Chretien is a modified form of the Cassegrain design, with a concave hyperbolic primary and a convex hyperbolic secondary. The advantage of this design is that both spherical aberration and coma are removed. Astigmatism and field curvature are also reduced, all at the expense of a larger secondary mirror. The shadow of the larger secondary covers some of the primary mirror. Hence the Ritchey-Chretien delivers significantly better imaging performance over a wider field of view than a Cassegrain, but with a slightly lower light grasp. Due to the expense of making hyperbolic mirrors, Ritchey-Chretien designs are usually only found in research telescopes. The best known example of a Ritchey-Chretien telescope is the 2.4m Hubble Space Telescope. So far, we have been considering telescopes composed of only mirrors, or only lenses. Of course, it is possible to combine the two. Telescopes that use both mirrors and lenses are known as catadioptric. They include the Schmidt telescope, built to image very large fields. The field of view of a reflecting telescopes is limited by coma to tens of arcseconds. 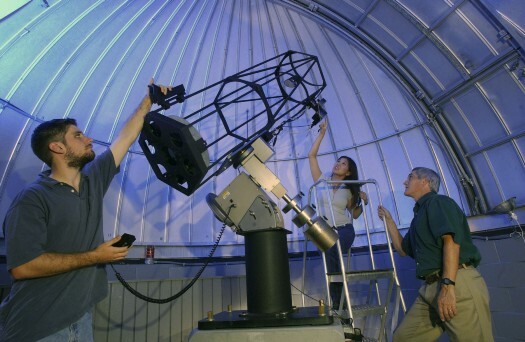 A Schmidt telescope uses lenses and spherical mirrors to image fields up to tens of degrees. Schmidt-Cassegrain telescopes are a hybrid of the Schmidt and Cassegrain designs. It is not a telescope you will find in major research observatories, but it is arguably the most widespread design used in the amateur telescope market. A schematic of the Schmidt-Cassegrain design is shown in figure 44. The 16-inch telescope on the roof of the Hicks building, and the 10-inch robotic telescope, are both Schmidt-Cassegrain designs. The great advantage of the Schmidt-Cassegrain design is that it is cheap to mass produce, thanks to the use of spherical mirrors. The resulting spherical aberration is dealt with by the corrector lens, a feature it borrows from the Schmidt telescope. 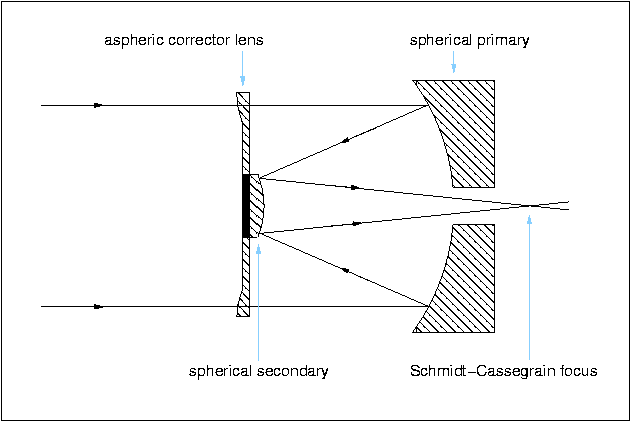 Unlike the Schmidt telescope, however, the Schmidt-Cassegrain suffers from off-axis aberrations like coma and astigmatism because the corrector lens is not placed at the centre of curvature. The Schmidt-Cassegrain retains one of the main advantages of the Cassegrain - a long focal length in a short tube, giving a telescope which is compact and portable yet able to provide small enough plate scales for detailed planetary viewing. This versatility makes them ideal for the amateur astronomy market. The typical focal ratio of a Schmidt-Cassegrain telescope is f/10 and they are available in apertures ranging from approximately 4-16 inches. Larger apertures become impractical due to the cost of manufacturing the corrector and mounting it without flexure (especially if the secondary mirror is attached to it).